after the very charismatic filterbank 1..
basically the Sherman Filterbank 2 is a synthesizer without oscillators! maybe a nice DIY project could make this machine a real charsimatic synthesizer? btw: I have never seen such a good manual with so many examples and really easy! enlarge above image? click the image..!! FM and AM! „distortion“ by overdriving the input! you have 2 independet filters both sweepable from LPF to BPF to HPF! also there is a nice knob for adjusting the filters called anti mix correction. here you can have non symmetric bpfs ,lpfs and hpfs.. so this makes another „kind“ of filter characteristics.. (eg: a hpf that still lets some bass freq. pass through).. I did a nice drumloop and shermanized it, you hear FM at audio speed (to the end) and some knob turns..
all is CC controllabe via midi but you also got the envelope out and trigger in. FM and AM in! enlarge above image Sherman Filterbank 2? click the image..!! see the harmonics knob? here you can set the second filter to be a static harmonics „generator“ for you! this make a lot of sense for drumloops and stuff.. I tested it with a fairly „non phat“-drumloop.. if you set it right, you can beef it up a lot!!! LISTEN! HEAR!, how it gets more phat (starting with original)..
23. shift + Oct./ + Quint. 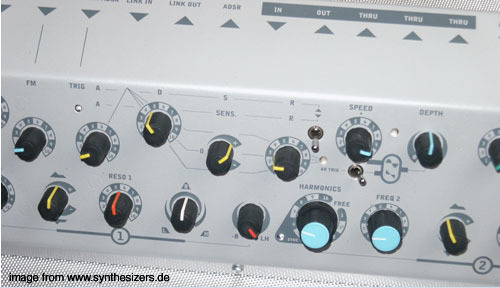 deutsch/british.. ANALOGE synthesizer / german distribution german/british and other synths.. vertrieb jomox, vermona, macbeth, mfb / fricke etc..
sherman is from belgium and have a very good site! check the video!! of course there was a filterbank 1 – the #2 is the predecessor..! 3 OSCs ring sync FM, 0 LFOs, 2 EGs, 1 FILTERs (4pole), no sequencer, no arpeggiator more..